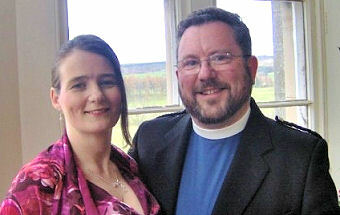 The Rev Dave Whiteman and his family are leaving Maybole after almost 10 years. Dave came to be minister of Maybole Old and when Rev Tom Bogle retired from Maybole West the two parishes combined Rev Whiteman became minister of the combined Maybole Parish Church. His wife Susan was chair of Maybole Community Association for several years and played the part of Agnes Broun in Maybole’s celebrations last year to mark the 250th anniversary of the marriage of Agnes to William Burnes. Their first born was Robert Burns. The last 10 years have generally been the happiest years of my life. Maybole is a wonderful place to live and to minister. The whole family have been extremely happy here and it is with great sadness that we leave. I have always seen ministry as being to the whole community and so it has been a great joy to be involved with many organisations in the town including the Men's Health Forum, the British Legion and the Community Association to name but a few. It is clear that Maybole has a wonderful community spirit - long may it continue. There are many reasons why we are leaving Maybole; some negative, some practical and some positive. On the practical side, Rachel is about to start secondary school and it is really now or never. On the positive side, this is a great opportunity for the newly united congregation of Maybole Parish Church to come together as a united congregation and to call a minister that you can all call your own and to go forward together truly united with a new minister who does not have the baggage of the Old or the West. A Minister accepted by all. The New Church project has been the cause of much heartache for us all including the New Church Committee. This committee has worked extremely hard over the last five years and they deserve your support. It’s not their fault that the project has taken so long, so please give them all the support and encouragement you can. I am convinced that the project will begin this year. I want to be clear that I am not leaving because of the delays in the project. The Gospel is a Gospel of new beginnings and so I wish you all well in your new beginning as you search for a new minister. He (or she) will be very fortunate indeed to come to a new charge with a new church and the most wonderful people you could ever hope to meet. During his time in Maybole Rev Whiteman and his family touched the lives of many people; and Susan played a key role in community life through her work with the Community Association and other groups. They will be missed.